We all know that braids, protective styles and definitely relaxers can have a negative affect of your hair and overall health, leading to recessing hair lines, alopecia and many other truly harmful issues. These health concerns are what have so may of us going natural to begin with, but ladies, beware! 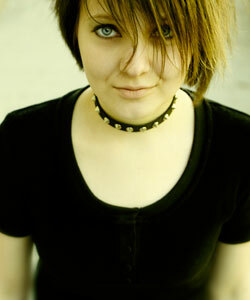 If you are wearing your hair down and over one of your eyes, Emo-style, the vast majority of the time, your hairstyle could have you developing lazy eye! OK - so maybe not all of us curlies are sporting a hair-over-the-eye look, but Justin Bieber better beware! Selena might not be so in to his hair-do once she finds his eyes a wandering elsewhere. Of course, other optometrists are speaking out against Hogan saying that the idea that a hairstyle could cause permanent vision damage is absurd. Maybe it is, but so is the Emo hairstyle altogether! After all, hair flipping and a deep-side part (which is totally in this summer, so watch out!) aren't mainstream hair culture. Then again, neither are our natural curls, coils and waves. Either way, curlies, maybe wear a headband to keep your tresses out of your eyes just in case!